Mixed Momentum: Busy, busy, busy!!! The last week has been super busy! A trip to Toronto to pick up my passport with the Russian visa laminated into it, a weekend of drytooling and putting up a new route, picking up and dropping off tools to be welded, packing for Bozeman, booking flights and filling out paper work for the Ice World Cup comps., and a couple appointments with my sports medicine clinic to make sure I don’t fall apart before the season really kicks off. On the surface it seems like to climb in the IWC you just need to be strong and find the financing. In reality you need to wear lots of hats and learn to juggle. Getting a Russian Visa isn’t the easiest thing to do. It’s a lot like applying for permanent residence to a new country. The forms are pages long, with in depth questioning. After the application is filled out you still need to drop the application and surrender your passport at the Consulate office. The actual application process can be done thru a broker for a hefty fee. For me it’s a bit easier to travel into Toronto and drop it off myself. It also made for a convenient way to drop a set of tools off to get the heads welded. My friend Paul is a welder and was able to weld them up for me. They turned out much better than I expected when I first decided that the heads needed to be welded. How the tools come as stock leaves the head as two pieces, which works great for changing out parts and adding hammer to the tools, but creates a weak link when the tools are subjected to extreme forces of hard drytooling allowing the head to flex sideways and sometimes bend. 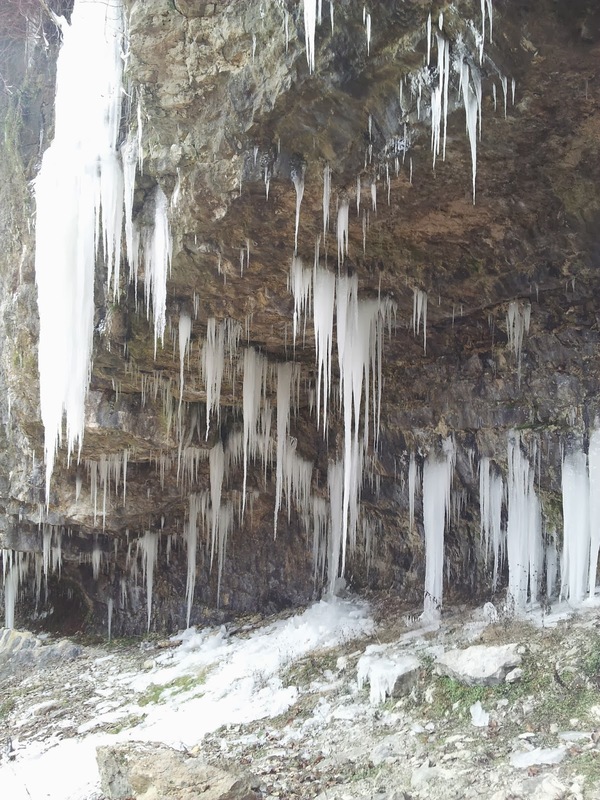 The weather had actually been kinda cold the week before and the local cliffs were starting to freeze up. Rebecca and I spent the weekend climbing at the Grotto where we did some training climbing and also put up a new route, “Pickpocket”. Saturday was a little bit of a late start. The cliff still wasn’t in super good condition yet as the water seeping out had filled many of the holds on the cave routes with ice and left other sections of rock unfrozen. I was pretty happy to start out on Highway robbery, a route that at the time that I did the first ascent was one of the most difficult in Southern Ontario. It wasn’t a complete gimme but I could remember just enough beta to get me through the hard sections quickly. 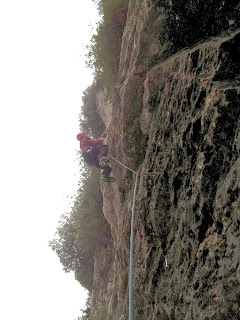 I was also pretty happy with climbing “Left Princess”. 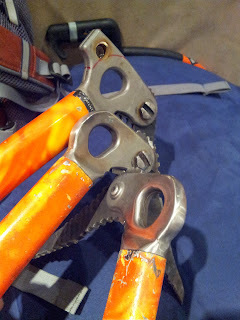 Most of the holds thru the easier opening section were filled with ice and I had to chop it out as I climbed. At the lip of the roof the crux was the easiest it has ever felt. 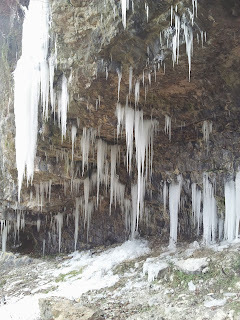 The Grotto Cave in early season stage of freezing up. 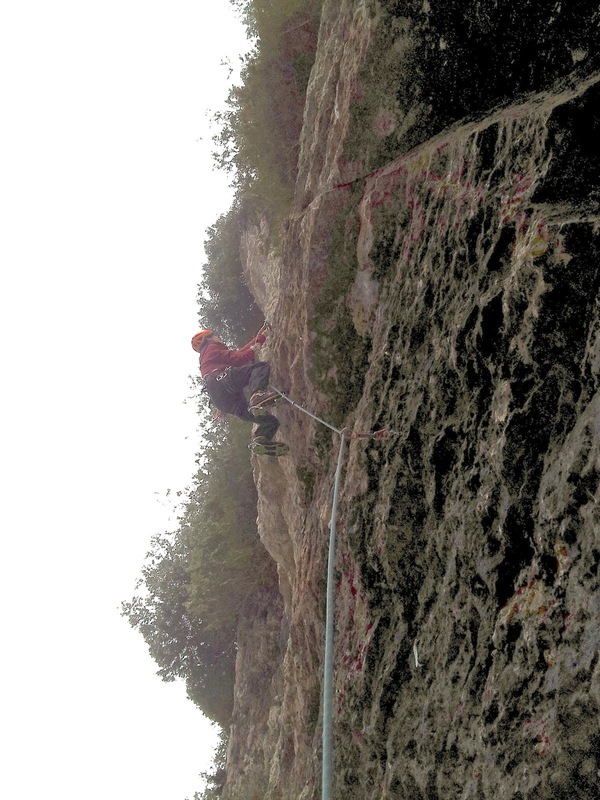 After a short day of climbing Rebecca went to hang out with some friends at the toprope section of the cliff further upstream and I dropped a rope on a line I had been looking at for a while. I didn’t think the new route would be very difficult, but it looked like a nice wall, gently overhanging and filed with pockets. I didn’t have much time before it got dark so I had to move quickly to clean and equip it. Fortunately the daylight lasted long enough to work my way close enough to the ground before it was completely dark. The next day wasn’t nearly as wintery as the previous week had been. We almost didn’t do the 1.5 hour drive because we thought the conditions at the cliff would be to bad with the warm temps. I was pretty excited to go back and finish up my new route so we pressed on driving through the rain. When we got to the Grotto the cliff wasn’t as bad as we thought it would be. After a quick warm-up on “Off the Couch” we went down to the new route to climb that and hopefully start working on another line near by. I started up the route and quickly bogged down. 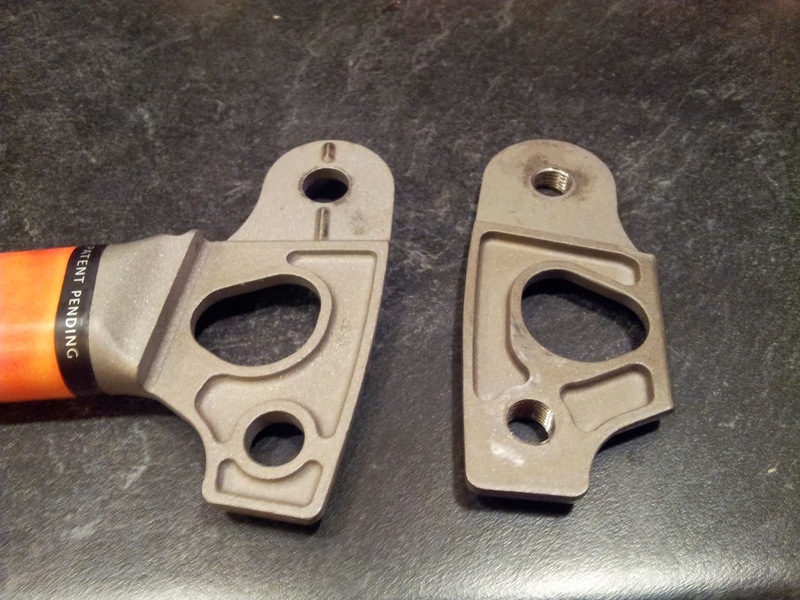 The climbing isn’t particularly straight forward as there are lots of pockets, but only a few are very good and some of them you need to take a certain way with your tool or they aren’t good. On top of that the holds still hadn’t bee cleaned so many were a little friable and crumbly. After falling off while trying to make a clip I decided it might be best to climb it bolt to bolt and clean up the holds a little bit first before trying to redpoint it. The climbing turned out to be a lot harder than I thought it would be. The holds are pretty technical, and there aren’t many good stances to rest. Bad footholds also seemed to be a theme. The route overhangs the whole way and once the angle lessens the holds get worse and further apart. We are unsure of what to rate "Pickpocket" but it felt to be in the 8+/9 – range. With traffic it might clean up better and become a little easier, or maybe harder as holds break off or deteriorate. The rest of the week was filled with frantic evenings of packing and booking tickets. My Moscow/Sochi ticket was first in the list to book. It’s a 2.5hour plane ride or a 2.5 day bus ride. While taking the bus might have been a neat experience, at least one way, the timeline for traveling and time away from being able to climb/train was too much. It seemed easy enough to book the ticket, but ended up being a nightmare. I tried booking thru a third party website and thought I had, but they called me back and said they weren’t able to book it. After searching out and booking my ticket thru a Russian airline which was partially in English and mostly in Russian I found out that despite them not being able to book the ticket they had no problem charging my credit card. I’m still trying to sort that part out. Fortunately booking my flights for Italy and into and home from Russia seem to have worked out okay. Lesson learned, always book thru the airline! A few more details need to be worked out and I can book my Korea to Romania and Romania home tickets. 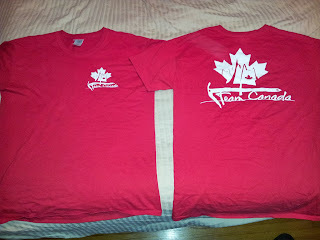 Some where along the way I got some more Team Canada T-Shirts made up. I'm planning to give these to the folks who support me and help fund my travel so I can compete. THANK YOU!! to all my supporters. Printed up the same as my jersey with the design by my teammate Gordon McArthur. Now we are currently traveling to Bozeman for the Bozeman Ice Festival. I’ll be competing in the UIAA North American Championship. This should be an interesting week.